Pulling to a stand, a photo by Venus In Furs on Flickr. Yesterday while my good friend Casey was visiting Ollie was playing on the floor in front of me. 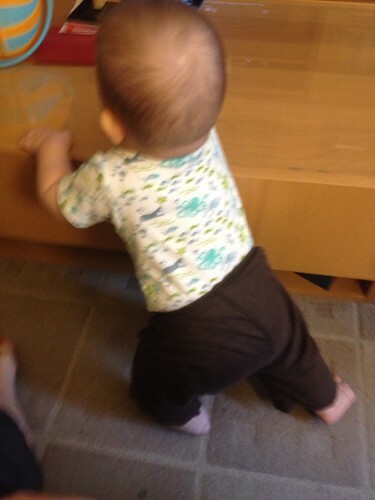 He reached up and pulled himself to a stand using the coffee table. Casey remarked, 'Oh, he's doing that now?' while I fumbled with my phone in order to snap this not very good picture. It was his first time. Soon there will be no stopping him. Also, he's got 2 teeth on top now to go with his 2 below. Snuggle, a photo by Venus In Furs on Flickr. Yesterday I noticed his third tooth poking through his gums! Top, front, right! It's hard work growing those teeth. upload, a photo by Venus In Furs on Flickr. I have to dig the stats out of a diaper bag so I can update this site with his size. His doctors appointment was almost 2 weeks ago now, and he's doing just fine. He's just dying to stand up and walk, and still working on crawling. He is proficient at rolling around and he gets himself up onto his hands and knees and rocks back and forth. One of these days he'll just take off, I just know it! He's also enjoying all stage 2 baby foods and still only has 2 teeth. 34 weeks, a photo by Venus In Furs on Flickr. 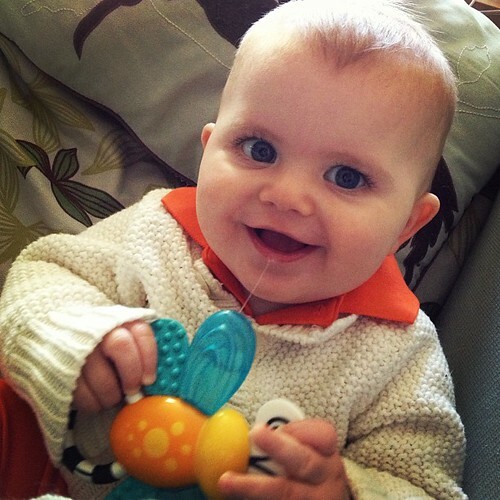 I can hardly believe that Ollie's 8 months old already! He goes in for a checkup tomorrow, and of course I'll update his stats after I know them. I'll take a wild guess and say he's as heavy as a big sack of potatoes and pretty tall!